In a study conducted by Harvard University on over 3000 women it was found that diet soda doubles the risk of kidney decline. Since kidney decline is not associated with sugar sweetened sodas, researchers believe that diet sweeteners are responsible. 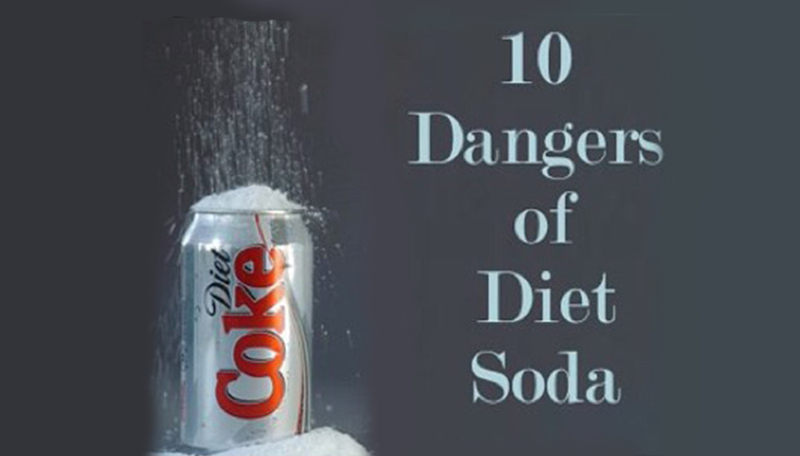 According to a 2008 study conducted in University of Minnesota over 10,000 adults, consumption of only 1 diet soda per day increased the risk of metabolic syndrome by 34%. The symptoms are belly fat and high cholesterol. Artificial sweeteners can disrupt the body’s natural ability to regulate calorie intake based on the sweetness of foods, suggested an animal study from Purdue University. Which means people who consume diet foods might be more likely to overeat, because your body is being tricked into thinking its eating sugar, and you crave more and gain more. Cocktails made with diet soda can make you intoxicated faster. According to study out of the Royal Adelaide hospital in Australia, sugar-free mixers allow liquor to enter your bloodstream much quicker than those with sugar, leaving you with a bigger hangover. Diet sodas measures 3.2 on pH scale which means it is very acidic. The acidic property of diet soda readily dissolves teeth enamel. According to an analysis of dental check-up data at the University of Michigan soda drinkers had greater decay, more missing teeth, and more fillings. Soft drink cans are coated with the endocrine disruptor bisphenol A (BPA) which has been linked to everything from heart disease to obesity to reproductive problems. Diet soda contains mold inhibitors which are absent in regular sodas. They contain sodium benzoate and potassium benzoate which are responsible for damaging cell walls. Drinking diet soda can lead to bone loss. Phosphoric acid present in diet soda causes calcium in your blood stream to be excreted more quickly through urine resulting in damage to bones. Many diet sodas contain caffeine which is an artificial stimulant and an addictive substance. Caffeine also impacts liver and hampers its ability to cleanse toxins from blood. Diet sodas use artificial sweeteners in place of sugar including Aspartame which acts as a neurotoxin. While artificial sweeteners may be a zero calorie alternative to sugar, they are in no way healthier.